WTI crude prices have surged to $48/b this morning. WTI opened at $47.39/b today, a strong recovery of $1.21, or 2.62%, above yesterday’s opening price. Current prices are $48.00/b, an increase of $0.67 above yesterday’s closing price. Product prices also rose strongly yesterday and this morning. Diesel opened at $1.4765/gallon in today’s trading session. This was an increase of 3.2 cents (2.22%) above yesterday’s opening price. 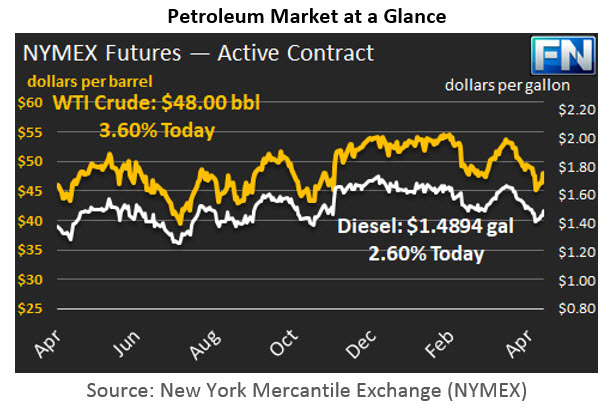 Current prices are $1.4894/gallon, an increase of 1.4 cents from yesterday’s closing price. Diesel prices opened 17.8 cents per gallon, or 10.8%, lower than they were four weeks ago. Gasoline opened at $1.5439/gallon today, a major jump of 5.9 cents, or 3.97%, from yesterday’s opening. Prices are $1.558/gallon currently, an increase of 1.84 cents above yesterday’s close. Despite the recovery, today’s gasoline prices opened at 22 cents/gallon lower than they were four weeks ago. Oil prices rallied strongly yesterday upon the release of the Energy Information Administration’s (EIA) official statistics on weekly oil supply and stocks. The EIA reported across-the board drawdowns in inventories: 5.247 mmbbls of crude, 0.15 mmbbls of gasoline, and 1.587 mmbbls of distillate. 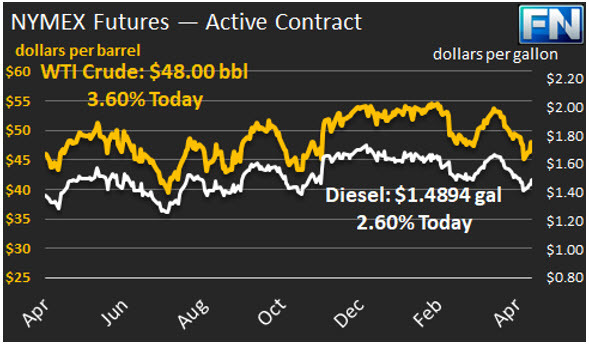 Prior to the EIA data release, the API reportedly estimated that crude inventories dropped by 5.8 mmbbls during the week ended May 5th, and diesel inventories were drawn down by 1.2 mmbbls. However, the API data showed a significant build in gasoline inventories of 3.2 mmbbls, which placed pressure on gasoline prices. Previous ArticleWill States Take the Lead in Raising Fuel Taxes for Infrastructure?